I'd like to take a moment to properly introduce the project that is consuming most of my time this year: HackRF, a software radio peripheral. Software radio or Software Defined Radio (SDR) is the application of Digital Signal Processing (DSP) to radio waveforms. It is analogous to the software-based digital audio techniques that became popular a couple of decades ago. Just like a sound card in a computer digitizes audio waveforms, a software radio peripheral digitizes radio waveforms. It's like a very fast sound card with the speaker and microphone replaced by an antenna. A single software radio platform can be used to implement virtually any wireless technology (Bluetooth, GSM, ZigBee, etc.). Digital audio capabilities in general purpose computers enabled a revolution in the sound and music industries with advances such as hard disk recording and MP3 file sharing. Today's computers are fast enough to process radio waveforms in similar ways, and the radio communications industry is going through the same sorts of changes. One critical advance has yet to take place, and that is the availability of low cost tools enabling any computer user to take part in the revolution. There have been some exciting developments in the world of low cost software radio hardware in recent months, but the HackRF project will go much further. A key advance will be the ability to transmit as well as receive radio signals, and HackRF will also enable operation at higher frequencies, including the popular 2.4 GHz band. Most importantly, HackRF is an open source project, so people will always be able to use and modify the hardware design and software in the future. We are being very careful to only use electronic components with published documentation (no NDAs!) and to avoid software libraries without open source licenses. This means more work for us, but we think that it will be worth it in the long run. Speaking of us, I should mention that I have some help on this project. My primary partner in this effort is Jared Boone of ShareBrained Technology (who has already written a bit about some of our development challenges). We've had some additional help from a few other people who hang out in #hackrf on chat.freenode.net, notably Benjamin Vernoux. Ultimately, the HackRF project aims to produce a single device that meets the goals above, but right now it consists of multiple development boards that connect together. 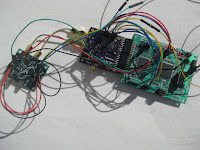 The microcontroller, USB interface, and power supply are on the largest board called Jellybean. The Intermediate Frequency (IF) transceiver, Analog to Digital Converter (ADC), Digital to Analog Converter (DAC), and clock generator are on a board called Lemondrop. Most recently, a wideband front-end called Lollipop is being tested. HackRF is based on a dual conversion architecture with a high IF (between 2.3 and 2.7 GHz), allowing us to take advantage of the excellent capabilities (per size, cost, and power consumption) of a wireless transceiver IC. I have used software radio techniques for wireless security research for years, and I teach a workshop each year at ToorCon San Diego to help more people in the information security community become familiar with the technology. Both for my own use and to promote wireless security research, I have long dreamed of building a low cost, portable platform. Now, with support from DARPA's CFT program, I am finally able to make this project a reality. Personally, I want a single device that can fit in my laptop bag, that doesn't require a bulky power supply, and that I can use to hack on whatever wireless systems I encounter. I'm hoping it will be about the size of a portable USB hard drive, and it will probably end up with a retail price in the neighborhood of $300, higher than technology-specific solutions like Ubertooth One but much less than any software radio transceiver on the market today. The project is going well, and we are likely to meet most or all of the goals. If there is one we miss, it will probably be the operating frequency range. 100 MHz to 6 GHz is quite ambitious! At the very least, we will produce a platform that allows operation over a wide range including both the 2.4 GHz and 900 MHz bands. HackRF is being developed on github. Documentation is coming together slowly on the wiki.